We're almost a year away from seeing the final chapter in the Skywalker saga as Star Wars 9 makes its way to theaters on December 20, 2019. Precious little about the actual story has been officially confirmed, except that this will completely wrap up everything involved with Luke and Leia's bloodline. J.J. Abrams plans to tie all three trilogies together in an epic way. There will be returning characters from the prequel trilogy, the original trilogy, and The Force Awakens trilogy. That's already a lot of characters to contend with. On top of that, Abrams and his crew are bringing in 8 new characters in total. But right know, we have absolutely no clue who they are or what they're doing. So far, most of the new secondary characters in the continuing Star Wars saga have failed to really connect with fans, and the trio of Rey, Finn and Poe have their detractors. The newer action figures like Rose Tico and General Hux have sat for years now, untouched at the local Target and other department stores still selling toys. They've earned the nickname Peg Warmers. With so many more characters being introduced in Star Wars 9, many worry that J.J. Abrams is creating a whole new batch of Peg Warmers for weary fans who just don't want to invest in Vice Admiral Amilyn Holdo toys. The hope is that each and every new character resonates with fans, and are worthy additions to this once glorious yet strained franchise. So far, nothing has been confirmed about who any of these new characters are. But there have been plenty of leaks, rumors and theories about who and what we'll be seeing on screen when the holidays role around again next year. So who are these new characters? Keri Russell is perhaps the biggest addition to the ever-burgeoning Star Wars universe. Her red hair had many speculating that she would be introducing Luke Skywalker's non-canonical wife Mara Jade. Others believe that Russell is playing Rey's long-lost mother, whom Kylo Ren lied to her about. Leaks make it hard to guess whether she is part of the Resistance or the First Order. Recent rumored leaks put her in the middle of the movie's climatic end battle sequence. She is described as wearing black clothing with a black cape. It is mostly believed that she is an ally to the First Order, and a character not seen in any existing Star Wars literature. She will be quite active in the movie, playing through some of the biggest action scenes being offered. One persistent rumor that won't go away is that she is a member of Kylo Ren's Knights of Ren, and could have been a former student of Luke Skywalker. One rumored leak that keeps popping up is that Adam Driver and Keri Russell share quite a few scenes together. It is believed that she is vital to Kylo, and somehow plays into the overall Skywalker dynasty. She could also upset the rocky relationship between Kylo and Rey, which some fans hope becomes romantic. Richard E. Grant is another big name that has been added to the Star Wars 9 roster, and he carries on a tradition of classic British actors joining the fray, including Alec Guinness, Peter Cushing, Christopher Lee and Max von Sydow (who is technically Swedish). Many believe that Grant is playing the expanded universe character of Grand Admiral Thrawn in Star Wars 9. The character was introduced into the official canon in Star Wars Rebels, and was still alive when that series came to an end. The actor certainly has the look of Thrawn. Grant previously liked a tweet that claimed he was playing the Grand Admiral, fueling rumors. He has since denied that he will bring the character to life on the big screen. Though nothing has been confirmed, it is almost a certainty that he is playing one of the new villains, and is part of the First Order. He could also be playing some kind of galactic criminal as the world around the Resistance falls apart, with Leia and her small team desperately seeking new members to fight the First Order. There have been a few murmurs that he is actually playing Rey's dad, but that sounds pretty unfounded. Perhaps the biggest new character reveal is that Naomi Ackie is playing Lando Calrissian's daughter. Some of the leaked story details claim that General Leia sends most of her Resistance troops into the outer rim looking for recruits. Finn, Poe and Chewbacca hook-up with Lando and his daughter Veranada Calrissian (Vera for short). Billy Dee Williams is confirmed to return as Lando, and it's believed that the father-daughter duo will come to Leia's rescue. Lord of the Rings star Dominic Monaghan is rumored to be part of Veranada Calrissian's posse. He's not a good guy in the generic sense of the word, but it's expected that he'll be giving the Resistance a helping hand when it comes to defending Leia and her friends. One of the leaks claims Dominic and Oscar Isaac have a confrontation scene, where Dom's character laughs in Poe's face after being confronted. The character has been called complex, and it appears that he may have lost a friend in the ongoing wars. He is morally straddling a grey line. Former Doctor Who star Matt Smith has also joined the cast in an undisclosed role. Many believe Smith has been cast as a young version of Emperor Palpatine, with time travel said to be a major factor in the storyline. There is speculation that Kylo Ren will visit the World between Worlds, and that a major connection between Snoke and Palpatine will be uncovered. It has also been rumored that Padme will return in the World Between Worlds. Even if Smith isn't playing Palpatine, it is suspected that like Richard E. Grant, he, too is definitely one of the new villains fighting on the side of the First Order. That's five out of the eight new characters accounted for. The other three characters haven't been speculated on or rumored at this time, so it's anyone's guess what J.J. Abrams has planned. We will probably be seeing a new droid or alien added to the mix. That's pretty much a no brainer, as this is Star Wars, and new droids and aliens are added to each film. It's expected that the first trailer for Star Wars 9 will drop during the Super Bowl. The Lucasfilm team is being really carful with this one. It's going to be a big event. And it needs to be perfect. Looking at who some of the new characters are, it's hard to deny though, that there is a peg warmer or two in that mix. 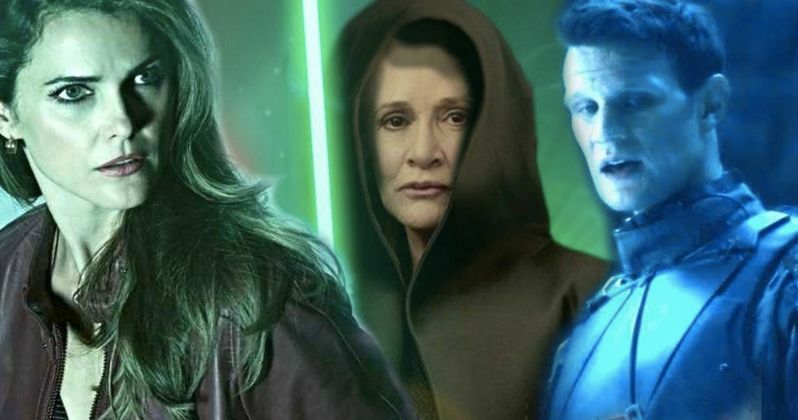 But seeing Vera Calrissian or Mara Jade on screen could really excite fans and entice some stragglers back to the cinema come December 2019. This latest Star Wars intel was culled from a recent story on Mirror.